British and Eire Association of Vitreoretinal Surgeons. The aim of the Association is to promote high quality patient care by supporting and representing British and Irish Vitreo-Retinal Surgeons through education, research, audit and revalidation. BEAVRS is neither a regulatory body nor a trade union. BEAVRS will accrue sufficient financial assets to entirely underwrite an annual meeting and fund the educational, research, revalidation and audit activities of the association. 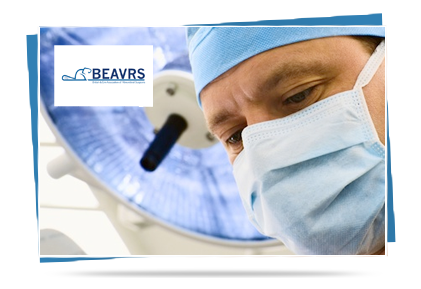 BEAVRS is the acronym for the British and Eire Association of Vitreoretinal Surgeons. The concept of a British Isles Vitreoretinal Society was conceived by David MacLeod, Tony Chignell and Peter Leaver. Their fellows at the time were David Wong, Paul Jacobs and Charlie James. This group of six are considered the founder members of the society and the first meeting was held at Keeble College in July 1986. The initial principles for the BEAVRS annual meeting were that everyone who attended should present and that problems would be discussed in an uninhibited fashion. The meeting was also to be itinerant being both hosted and organised locally. The meeting has grown to more than 200 delegates so the former principle is no longer applicable, but there is still a tradition of frank exchange and discussion. From 1993 BEAVRS have had an international visiting speaker who has given a guest lecture and contributed to discussion at the meeting. The list of luminaries invited has included Alain Gaudric, Peter Wiedermann, Carl Claes, Michael Trese, Cynthia Toth, Berndt Kirkhoff, George Williams, Jan Van Meurs, Don D’Amico, Ian Constable, Arndt Gandorfer, Stanislaw Rizzo and Kirk Packo. The 2013 BEAVRS International Visiting Speaker with be Professor Ferenc Kuhn. Professor Kuhn is Associate Professor of Ophthalmology in Birmingham Alabama, USA and Visiting Professor at the European University, Belgrade in Serbia, and has acted as a Consultant in VR surgery in Poland and Germany. He is President of the International Society of Ocular Trauma and an Editor for 8 Ophthalmic journals. He is also the author of 134 scientific articles, edited 4 books and produced 91 chapters in 29 books. He has been the invited speaker in 52 countries and we are delighted to have him this year at BEAVRS lecturing on the management of severe Ocular Trauma and Rhegmatogenous Retinal Detachment prophylaxis & treatment. For the first 24 years of its existence the Society prided itself on having no formal structure. However, the size of the meeting has grown to exceed 200 participants and this places an untenable financial burden on the host unit. In addition to this, there have been recent developments in revalidation and licensing of specialists. A decision was therefore unanimously taken at the 2009 BEAVRS meeting in Amsterdam to formalise the structure of the Society. This will provide a vehicle for Vitreo Retinal specialty licensing and standards within the United Kingdom as well as providing a formal administrative and financial structure with which to support the annual meeting. An BEAVRS board was elected and approved at the 2010 meeting held at Celtic Manor, Wales. The board members are David Wong, David Steel, Richard Sheard, Tim Jackson, Alistair Laidlaw, Tom Williamson, Som Prassad and Gurmit Uppal.